Are you on a boat? Do you need to be able to receive up to date weather and marine safety transmissions? 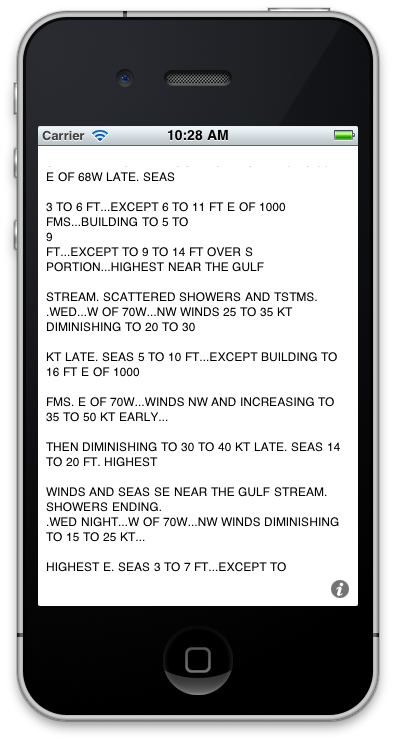 NAVTEX Pad lets you view NAVTEX marine weather transmissions on your iPhone, iPod Touch, or iPad. Just set it near a radio (or for better quality decoding, connect a cable from the radio's audio output jack to the microphone jack), tune in a NAVTEX frequency, and watch the transmissions. NAVTEX weather and marine safety messages are transmitted from dozens of sites around the world. Now you can display these messages without buying a dedicated NAVTEX receiver. Most NAVTEX transmissions are on 518 kHz. If you tune in to 518 kHz via USB mode, set your radio to 515.8 kHz USB, set the frequency in the app to 2200 Hz, turn on invert mode, and when the next scheduled transmission begins, NAVTEX pad will start decoding. You can listen to and decode this NAVTEX recording as a test. Set your app to a frequency of 2220 Hz with Invert OFF. Note that NAVTEX transmissions are not continuous, many stations share the same frequency, so you need to wait for the station closest to you to start transmitting. Buy your copy of NAVTEX pad today, and never be without up to date marine weather information again. 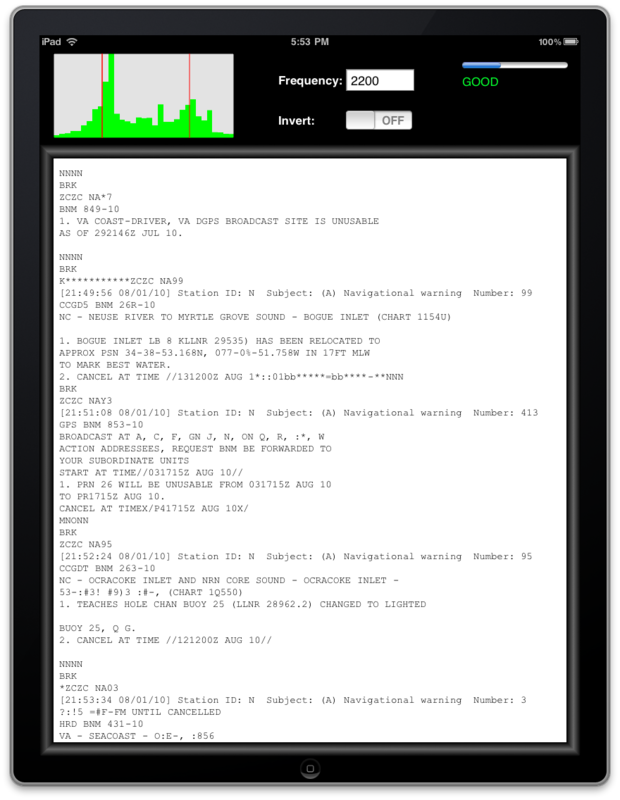 Visit the NAVTEX Pad FAQ page for full details on how to use the app.